There’s a lot that can be done when your furnace isn’t working properly or it simply needs some maintenance, but eventually the time will come when you need a new furnace. When that day comes, the technicians at Ace Hi Plumbing will be there to help you choose the type of furnace that is best for your home, to install the furnace, and we’ll be there for all of your future maintenance needs. We understand the pain of having to replace the heater in your home, but our furnace specialists will make sure that the process goes as smooth as possible. 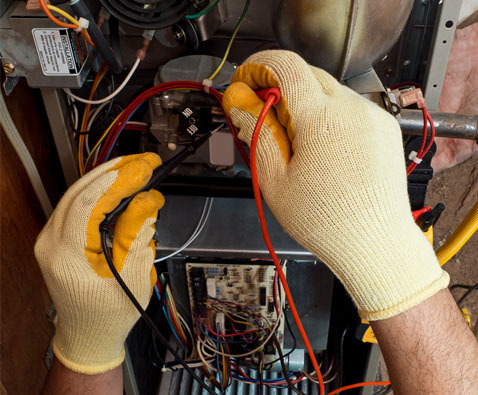 One of the biggest signs that you need a new furnace is that repairs are becoming more and more frequent. Just like cars when they are on their last leg, if you’re spending more on repairs than it would to purchase a new system, it’s time to call for an estimate. As the heater ages, it can develop cracks in the heat exchanger or inside the furnace. Structural issues or rust could lead to carbon monoxide leaking into the home, which is a serious and harmful issue. If you’re starting to hear noises, such as a banging, popping, rattling, or squealing. Or, if the blower is constantly running, this may be a sign that it’s time for a furnace installation. The size of the furnace will ensure that your home is as efficient as possible. Your HVAC technician will offer suggestions based on the size of your home and take the home’s insulation into consideration. The most common type of furnace system is gas, but there are also boilers, which use water, or heat pumps, which are essentially air conditioners in reverse that use an electrical system to pull heat from the outside. Heat pumps aren’t the best option for the Northern Colorado climate, however. The Annual Fuel Utilization Efficiency Rating (AFUE), will tell you how efficient the furnace is. A rating between 60 and 80 percent is common, but it can reach up to 98 percent. You can also look at the Energy Efficiency Ratio (EER), which will help you find a cost-efficient furnace. If you’re in need of furnace installation, Ace Hi Plumbing has a team of technicians who are highly trained and have all the necessary certifications to ensure that the job is done right. We serve all of Northern Colorado, including Fort Collins, Loveland, and Estes Park. We offer quality HVAC service, including air conditioning, water heaters, plumbing, and more.